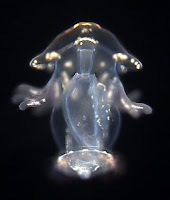 This is a dark field microphotograph of an actinotroch larva that, according to Dr. Elena Temereva, a Russian specialist on phoronid development who examined the larva, belongs to the horseshoe worm Phoronopsis harmeri (Temereva 2009). This species, also known as Phoronopsis viridis, is a common intertidal species on the sandflats in the Pacific Northwest. This particular larva was caught in a plankton tow I took in August 2006 in a channel separating the San Juan Island and the Shaw Island in Puget Sound, WA. This larva had 16 tentacles and was about 0.9 mm long. Its broad preoral hood is up. The semi-transparent tube inside is the stomach. A ring of cilia at the posterior end (down) is the telotroch, which propels the larva through the water. This larva had numerous pigment granules (which appear golden in reflected light and black in transmitted light) along the tentacles, the margin of the hood, the telotroch, and even the protocoel (a small coelomic sack in the hood). Temereva EN. 2009. New data on distribution, morphology and taxonomy of phoronid larvae (Lophophorata: Phoronida). Invertebrate Zoology 6(1): 47-64.